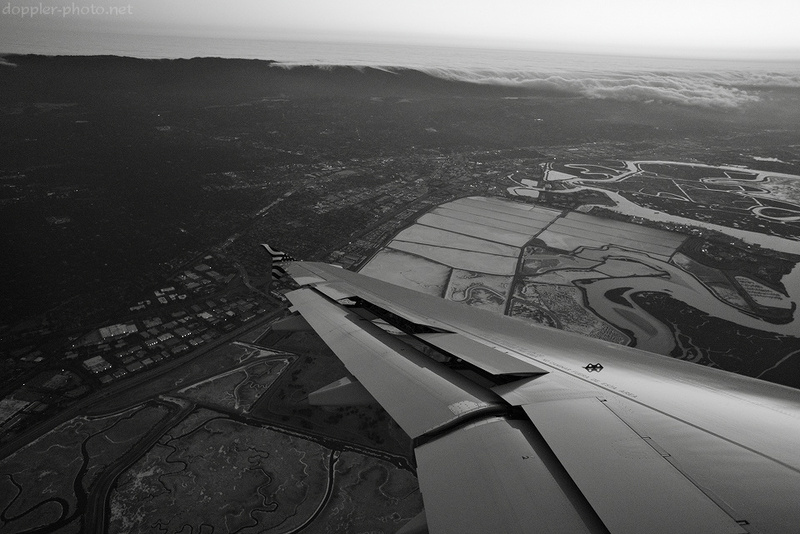 I shot this as my plane was lining up for SFO final approach a few hours ago. I love taking photos from aircraft, and taking photos near the ground is definitely a vice of mine — it's simply the best opportunity for interesting photos. In this case, I was stunned by the clouds rolling over the Santa Cruz mountain range. It's amazing how they look exactly like a wave breaking on a beach — just like water in slow motion. It's easy to forget all the ways that fluids affect our lives (such as the ability fly in the first place — air is a fluid). Hopefully, this photo might serve as a small reminder that Reynolds numbers and Navier-Stokes and all those things actually do mean something in real life. If you'd like a copy of this in print, let me know. It looks great in a larger format.